Students at the Clark Memorial Library at Shawnee State University. PORTSMOUTH, Ohio – Shawnee State University’s School of Education and the Clark Memorial Library (CML) are teaming up to create a new learning endeavor for its students. Downstairs in the CML, the Curriculum Materials Center (CMC) is getting a makeover, one piece of furniture at a time. “The CML is looking to use the CMC in new, and more relevant ways, and I think it’s a great time to capitalize on this opportunity by establishing a collaboration between the CML and the School of Education,” Dr. Aaron Bruewer, Assistant Professor of Educations, explained. Janet Stewart, Dean of Library Services, and her team hope to transform the CMC into an educational innovation center, and the idea fit right in with the 21st century teacher education. “21st century teacher education isn’t just desks in rows, direct lecture, or even teacher controlled. This area will provide a different experience so students can think outside the educational box. The only way to prepare our students to be different is to let them experience something different. We have to continue to develop educators that are forward-thinking and not simply managing the status quo,” said Dr. Bruewer. As part of the same idea, Dr. Bruewer moved his educational technology course to the library this past fall semester. 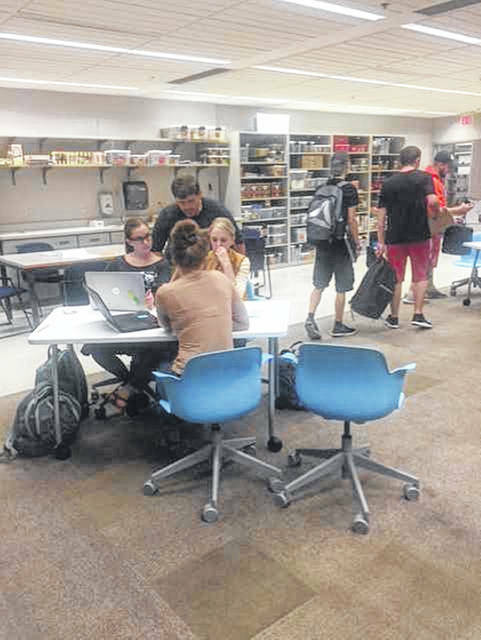 The new tables and chairs are mobile and allow students to move around, work in collaborative pods, and let them focus on interpersonal relationships while co-using technology to complete problem solving tasks and constructive assignments. Future plans will seek funds to continue creating this new learning space, which includes purchasing 3D printers, poster printers, plotters, and items to help spark a teacher candidate’s imagination. For more information about the CML renovations, please contact Dr. Bruewer at ssubruewer@gmail.com or Stewart at jstewart@shawnee.edu. To make your own gift in support of SSU, please contact the SSU Development Foundation at 740.351.3284. or give online at www.givetossu.com.